Griffin Wolfe, the undefeated jousting champion. When he is unhorsed by a slip of a woman who is not a knight, he demands retribution. His honor will not allow him to let a woman be thrown in the dungeon and he has no choice but to pay her fine, ordering her to travel with him until her brothers can repay him. Griffin attempts to educate Layne in the art of being a woman, but finds he is attracted to her exciting personality and uncommon beauty despite her less than lady like ways. But someone is trying to sabotage Griffin as he competes in the tournaments. Can Layne and Griffin discover who the culprit is while keeping their families safe and their growing attraction secret? 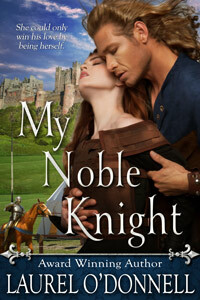 Click HERE to read My Noble Knight’s first chapter!